In July French rower Mathieu Bonnier started rowing from Qaanaaq in Greenland towards Resolute Bay in the north of Canada where he arrived a week ago. He has left again over the weekend to carry on with his Northwest Passage row. During his row from Qaanaaq to Resolute Bay Mathieu encountered sea ice that blocked his way, and icebergs and colonies of walruses that were best avoided. On the way to Resolute the lone rower met with two Canadian coast guard ships, the ‘Henry Larsen’ and the ‘Terry Fox'. The ’Terry Fox’ helped Mathieu after he had a very difficult night with little sleep while the tide was pushing his boat against the rocks. His home team said during his row he slept for one or two hours at a time, interrupted by weather issues and drift control through surrounding icebergs. The wind was not always in favor of the rower. The home team once reported, "Mathieu had headwinds for 5 days, which prevented him from making a direct route. He struggled to paddle like hell as long as possible each day against the wind. You have to imagine waves of 1 to 2 meters hitting the boat with the spray at 0°C. He rowed 12-15 hours per day in these conditions. When he stopped, he put out a para anchor to avoid drifting. There were a lot of ice in this area and big icebergs were seen from afar. On July 28 his home team reported that Mathieu has crossed Baffin Bay in 12 days, after a brave effort in difficult conditions. He encountered a lot of ice during the last miles. He arrived in the middle of seals and he met his first Polar Bear, a male who was swimming about fifty yards from the boat. So he rows with his rifle on his shoulders, but the risk was minimal when it moves away from the ice floes, reported the home team. The sea ice was a big challenge up to the last minute of his arrival in Resolute Bay. Mathieu crossed the Strait of Wellington, but was blocked by ice and 70km/h winds near Cape Dungeness only 20 minutes from Resolute Bay. After a week’s stay in Resolute Bay, waiting for good conditions, he departed over the weekend, reported Maurice Uguen to ExplorersWeb. His latest position according to his map is 73° 51.45 N, 95° 30.55 W (Marine GeoGarage). No new updates since his departure. When he left Resolute Bay the coast guard warned Mathieu about ice between Resolute and Cambridge Bay and they asked him to stay in daily contact with them. Mathieu Bonnier is a veterinary surgeon who has skied across Alaska in the winter of 2006 with his dog Tico. He participated in the 2007 World Rowing Championships and in 2009 rowed the Bouvet Rames Guyane Transatlantic Rowing Race. Mathieu rowed the 4700 solo and came second after being 43 days at the oars. Mathieu Bonnier plans to transit the Northwest Passage in a rowboat. He started from Greenland in the summer of 2010 and plans to complete the row in the summer of 2011 when he reaches Alaska. During the Arctic winter months he will take a break and wait for daylight again. His dog Tico will meet up with him along the route. NOAA's Fisheries Service has designated the eastern North Pacific basking shark, a 'species of concern' because it has suffered a dramatic decline in population despite decreasing fishing pressure. The label 'species of concern' may be given to a species when there are concerns regarding the population status. The eastern Pacific basking shark is not being considered for listing pursuant to the Endangered Species Act, rather it is a species of concern because it has been over fished and its population has apparently not responded to conservation measures implemented to address fishing pressure. We expect that by identifying it as a species of concern we will raise public awareness of the species status, generate interest in additional research to identify factors that may be inhibiting its recovery and, with states and other partners, restore this population before listing under the ESA becomes necessary. Basking sharks are filter feeders that exist throughout the world's oceans from the tropics to the Arctic, although they are most commonly found in temperate coastal waters where currents converge and plankton, their main food source, concentrate. The eastern North Pacific population of basking sharks is thought to be a single group that migrates seasonally along the West Coast from Canada to Central California. Until the 1950s, commercial fishermen in California targeted the sharks primarily for fishmeal and fish oil, and Canadian fishermen targeted them until the 1970s, in response to an eradication program that sought to reduce interactions between the sharks and salmon fishing nets. Although there has been no commercial fishing pressure for decades, scientists are worried about the eastern North Pacific population of basking sharks, whose numbers have not rebounded. While hundreds, and even thousands, of fish were once observed together, no group larger than three has been reported seen since 1993. The species is also still vulnerable to human impacts even though it is no longer actively targeted in the United States and Canada. Fishermen may inadvertently catch the shark while fishing for another species, or it may become entangled in commercial fishing gear or hit by vessels as it feeds near the surface. In U.S. federal waters of the Pacific, sharks caught incidentally must be released immediately, and the state of California has likewise banned the retention of basking sharks. In Canada, the Species at Risk Act makes it illegal to take, harass, or destroy habitat for basking sharks there. The species is also listed on the International Union for the Conservation of Nature (IUCN) Red List as endangered. Basking sharks may still be caught in some countries where they command a high price for their fins in shark fin soup. CF BALTICA, DWT 117000, completed an historic NSR voyage by passing Bering Strait into Pacific Ocean on 27th August at 08.00 hrs Moscow time. This is the first time that a tanker of her size completed such voyage. An historic event. The tanker loaded with 70,000 tonnes of gas condensate in direction to her discharge port Ningbo (China) ETA in the first half of September 2010 (06/09). The NSR voyage had been carefully planned by thorough and professional preparatory work by SCF Unicom, the Technical Manager and Operator of this vessel and her Owners SCF Sovcomflot. These involved all areas related to the navigation/technical as well as all necessary requirements of NSR rules and Russian legislation in order to provide safe navigation and protection of the Arctic environment. Risk Assessment and the required actions of crew and related shore unites in a potential emergency were thoroughly considered and contingency plans were developed. SCF Unicom’s tanker crew includes seafarers with practical experience of ice operations including sailing along the NSR shipping lanes. SCF Baltica’s crew received additional and upgrading training for this voyage. Thorough support and assistance was received by the departments within Russia’s Ministry of Transport. The vessel’s route took her through the Barents Sea (North of Cape Zhelaniya on Novaya Zemlya Island); the Vilkitsky Strait, which ended in the Taimyr ice field, then through the Sannikov Strait, the Laptev Sea, the ice fields of the East-Siberian Sea (checking with Mogilyuk) and Chukchi sea. The passage of 2500 miles between Murmansk and Pevek required only 11 days. She arrived at Pevek on 24th of August pm ahead of her schedule. At different stages of the NSR route, passing in particular through Vilkitsky, Sannikov and Longa Straits, the tanker was escorted by nuclear-powered ice-breakers Taimyr, Rossiya and 50 let Pobedy (50 years of Victory). Radar images of RADARSAT-1 were used to assess ice situation along the ship route and to select the optimal itinerary. Receiving centres of the ScanEx's network were used for operational acquisition, processing and transmission of the satellite imagery data: automated ground receiving stations UniScan in Moscow, Megion and Magadan. After processing the product was transferred in real-time via the Internet network through "Atomflot-Kosmosnimki" geo-service. The geo-service was created based on the GeoMixer technology in behalf of Atomflot that placed a request to ScanEx to collect and process satellite radar data in 2010 about the ice situation on the NSR route and the Non-Arctic freezing seas of Russia. During the summer navigation period FSU Atomflot (the service base for the nuclear icebreakers) on numerous occasions used satellite radar data for escorting ships along the NSR route. The work experience shows that the application of space images allows increasing only the safety but the economic efficiency of maritime ice operations under the conditions of Arctica. By the end of this voyage SCF Baltica will have covered 7000 miles from Murmansk to China instead of the 12000 miles required passing Suez Canal. Statistical data collected during the voyage will form the basis for planning similar voyages in 2011 and for further research required mapping new deep water routes in the high latitudes of the Arctic. Google Maps : A comparison of traditional shipping routes and the Northern Sea Route (NSR). And you thought Shrek liked hanging out only in his swamp. Turns out there's a fish that greatly resembles the green ogre swimming off the coast of Japan. A buzzy video shot by a scuba diver made its way to WYFF the NBC television affiliate based in Greenville, South Carolina. The station explains that this particular fish is an Asian Sheepshead Wrasse, and it is relatively common. What's less common is that this particular fish, estimated to be about 30 years old, bears a startling resemblance to the grouchy ogre. The head, the chin, the beady eyes — it's all there. The bulgyhead wrasse, an odd-looking, meter-long fish with bulbous head that is found in waters off Sado Island in northern Japan, was featured in the film "Oceans". A big rock is sinking deeply under the sea and it is called the Red Rock. Several fishes live there and nobody attempt to catch them; then they are not afraid of human, and never run away. They eat shellfishes, have strong teeth and grow big. The bulgyhead wrasse species, or kobudai in Japanese, is affectionately known to local divers as the benkei fish because its head resembles a lump said to have been on the forehead of the legendary warrior monk Musashibo Benkei of the Heian period (794-1192). Toby Lester -- a longtime editor and writer for The Atlantic, and the author of The Fourth Part of the World (2009) -- will be here to talk about what may well be the greatest map ever made: the Waldseemüller world map of 1507. A giant wall map recently purchased by the Library of Congress for the astonishing sum of $10 million, the map's main claim to fame is that it gave America its name. But the map also represents a number of other important firsts in the history of cartography, and in the larger history of ideas. It was the first map to show the New World surrounded by water, and thus to suggest the existence of the Pacific Ocean; it was one of the very first maps to lay out a picture of the world in a full 360 degrees of longitude; and it was the first map to present the contours of the world's continents and oceans largely as we know them today. It was, in many ways, the mother of all modern world maps -- and yet, mysteriously, it was made years before Europeans first saw the Pacific or circumnavigated the globe. With the help of a weird and wonderful variety of early maps and diagrams, Lester will show how the Waldseemüller map for the first time brought together elements of many different ancient and medieval cartographic traditions and used them to create a map not only of space but also time. "The right technology at the right time can change the world. Toby Lester has written a page-turning story of the creation of what amounts to a sixteenth-century Google Earth, a revolutionary way to see the world. It inspired generations of explorers then and will inspire readers now." Yachtswoman Ellen MacArthur has set herself a new long-distance challenge - creating an educational foundation to promote sustainability. Now retired from racing yachts, she has committed herself to changing attitudes towards the planet's finite natural resources. She wants to persuade young people and businesses to re-think how they use and design products. "The foundation will be a catalyst for change," she says. Speaking in London ahead of the launch of the project, Dame Ellen says that this vision of a more sustainable economy has replaced her consuming passion for sailing. "Five years ago I would never have dreamt I'd be doing this," she says. "But it's become the most exciting thing I've ever done - and I never thought I could say that about anything other than sailing." The inspiration for this sustainable way of living came from her experience of long-distance voyages, she says. "When I was at sea I managed whatever I had incredibly carefully, so I never left a computer screen on, never left a light on, I was careful with food, because you know that is all you have." "What you have on board is finite. If you drop the only screwdriver over the side, it's gone forever. There is no more. You have to live in a very different way." It started to make her think of the world as being like a boat stowed with finite supplies - except that unlike the frugal long-distance sailor, as a society we were tearing through what was left of the oil, gas and coal. When she began examining the alarming rate at which resources were being used - she found herself wanting to do something about it. "I'd come across something. From the moment I discovered it, it was as if I'd picked up a stone that I couldn't put down again." The foundation will promote ideas for businesses, schools and universities which will encourage people to re-think how the earth's resources are being used. This isn't a moral message, she says, but a practical one - a form of enlightened self-interest. The increasing expense of raw materials is going to drive the development of more efficient ways of working, she says - and she wants her foundation to encourage young people to develop such changes. Products and services will have to be designed to minimize waste - and she says jobs will be created to serve this new economy. She says the point is not to urge people to consume less, but to make sure that products are made from materials that can be re-used. Anything from carpets to washing machines to cars should be re-designed in a way that means that nothing ends up taking the one-way trip to the landfill. "It's about designing things so that the materials used for a shirt can be re-used for another shirt or turned into a pair of trousers. It's not about using less and less. It's about finding a cycle that works." But a word she doesn't use is "green". And she admits to having difficulty with the terminology of environmentalism, aware that the language of the eco-warriors can have a negative effect. "What does 'green' mean? It's not about 'green' or 'the environment'. You could argue it's about how we maintain a good quality of life. It's about how we're going to prosper in the future, when we're so dependent on something that won't be around forever." Even the word "sustainability" is less than compelling, she suggests - saying that you wouldn't want to describe a relationship with someone as "sustainable". But there is no doubting the seriousness of her intention - applying the dedication of the long-distance yachtswoman to the long haul of promoting her arguments. There are links being set up with universities, partnerships with businesses and talks with educational organizations. The foundation also provides another horizon for someone who achieved their lifetime's ambition at an early age. After setting a world record for a single-handed circumnavigation of the globe at the age of 24 - and becoming the country's youngest dame - she was left with the "What now?" moment. "Round the world had been my goal - and the moment I'd got there, it wasn't there any more, I'd done it." Dame Ellen is now recycling her own energies into launching the sustainability foundation - and says she is optimistic about a positive result. "This is an inspirational message, an aspiration - but getting there will be the most herculean challenge we've ever faced." Scientists have found evidence for an ancient sea passage linking currently isolated areas of Antarctica. The evidence comes from a study of tiny marine animals living either side of the 2km thick Western Antarctic ice sheet. 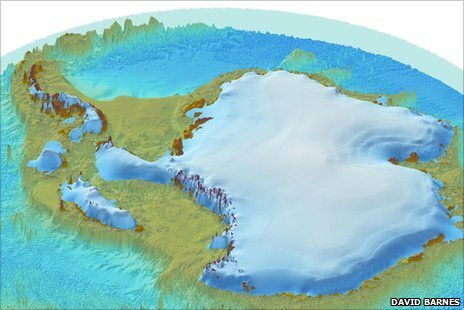 Reseachers think their spread was due to the collapse of the ice sheet as recently as 125,000 years ago allowing water flow between different regions. Their findings are published in the journal, Global Change Biology. Bryozoans are tiny, filter feeding marine animals which in their adult form are immobile, living glued to the sides of boulders, rocks or other surfaces. As part of the Census of Antarctic Marine Life scientists from the British Antarctic Survey have revealed striking similarities between the Bryozoans living in the Ross and Weddell seas. These are 1,500 miles apart and separated by the Western Antarctic Ice Sheet (WAIS), the third largest ice mass on the planet. The finding led the scientists to conclude that these marine animals could only have spread across both seas if there had been a partial collapse of the WAIS opening up a trans Antarctic seaway. They believe this could have been as recently as 125,000 years ago. It would only take a partial collapse to have a huge impact on sea levels raising them by as much as five metres globally. While there is some geological evidence for the collapse of the WAIS at least once in the last million years, the data has been limited. Dr David Barnes, from the British Antarctic Survey is the lead author of the survey. "There was no real smoking gun saying yes it's happened recently. This is the first time there's hard direct evidence that there has been a collapse," he told BBC News. "For us that is a big deal. That would make the WAIS the least stable of the three ice masses and so that would mean that we could expect more sea level rise than we might have bargained for." Because Bryozoans are abundant, fossilise easily and exist in many different, but highly localised forms, they are very useful for scientists trying to understand the connections between places. "What we've got is this group of animals that don't disperse very well because the adults don't move at all and the larvae are short-lived and sink so they find it difficult to get around," said Dr Barnes. "So you're left with this nice signal of where things used to be connected, and in this case it appears to be a connection between what is now an ice sheet." He told the BBC he thinks the opening up of the seaway and the sea level rise that goes with it could have been relatively recent. "It has to be recent because otherwise we would have lost the signal of connectivity... each ice age would have bulldozed out most of the animals living on the continental shelf. It's asking a lot to maintain a strong signal over multiple ice ages. " The findings are a critical in understanding the future stability of the Western Antarctic Ice sheet and how ice sheets behave in different climate scenarios. Scientists believe a future collapse of the WAIS would raise sea levels globally by 3.3m - 5m.